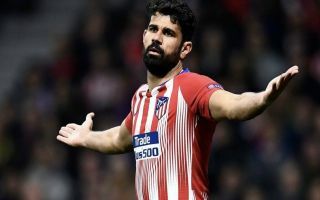 Atletico Madrid striker Diego Costa squandered a golden opportunity during Wednesday night’s Champions League clash against Juventus. The Spanish hitman has only managed to score four goals in 16 appearances for the La Liga giants across all competitions this season, continuing his struggle for form and fitness since his return to the club from Chelsea in 2017. Atletico secured a 2-0 win in the first leg of their last-16 European tie with Juventus thanks to goals from Jose Gimenez and Diego Godin, but Costa should also have gotten himself on the scoresheet. The 30-year-old found himself clean through on goal early in the second half, but as he approached Wojciech Szczesny in the Juve net, he lost his composure and fired the ball well wide. The shocking miss shows just how far Costa has fallen since his days at Chelsea when he used to score goals for fun and torment defenders with his physicality and instincts in the final third. Check out a clip of his missed chance below, via Twitter.